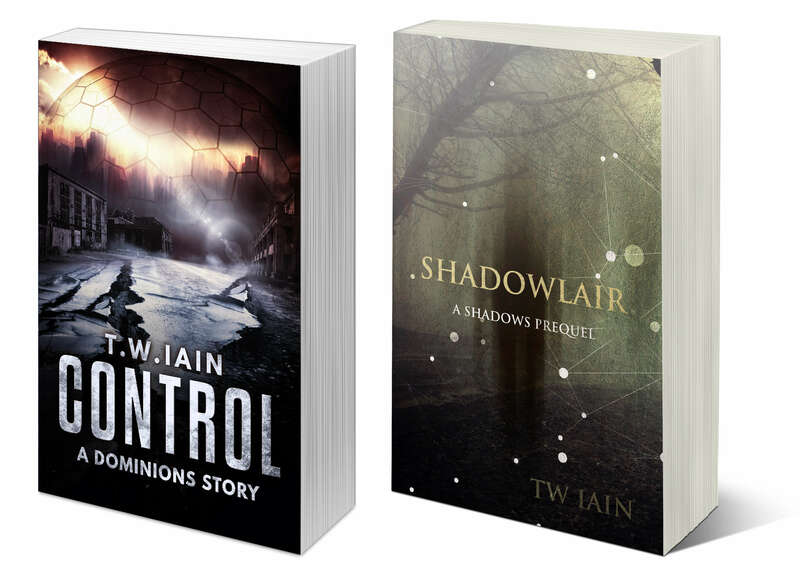 Last time I posted about re-writing the first Dominions book was some time ago, when I was approaching the final edits. I’ve now done all this work‌—‌polishing the text, removing any typos I found, and so on. Then I sent it off for an edit/proofread, formatted it and uploaded the finished file. Book done. It’s available now, for free, from all the usual stores. Reading that back, it sounds pretty run-of-the-mill, nothing exciting. In some ways, this is true, for me at least. I prefer the creative parts of writing‌—‌figuring out the story, working on the characters, writing and moulding the first draft. That’s the stuff that gets me fired up. All the polishing and prettifying is a kind of relaxing come-down, a lull before I dive into the next story. And that’s where I am now‌—‌struggling with a plot that doesn’t quite work and characters with dubious motivations, and I’m enjoying the challenge of writing Dominions V.
But I’m pleased with the rewrite of Dark Glass. The main problems with the original version were poor writing that slowed the overall story down and a protagonist who, for the most part, allowed himself to be carried by events. The new edition has tackled both of these. Even with scenes added and a more involved story, the new version clocks in at around 10,000 words less than the original. And Rodin, the protagonist, is far more active, working on killing his target from the moment he sets foot in the Dome. So this re-write has been a creative success. The other reason for doing this re-write was to make the first book in the series stronger in order to encourage more readers to buy subsequent books. It’s too early to tell if this is coming to fruition, but I’m quietly optimistic. Is this something I’d do again? I’m not ruling that out, but for the moment my energy and time are better served by working on new books. But I’m pleased I’ve done this re-write. The Dominions series now has the opening book it deserves, and I’m going to feel more comfortable marketing this book now. And if you want to check it out, it’s free from all major e-book retailers (and quite a few smaller ones). For a complete list of stores, click here (or on the cover). And if you read this new edition, I’d love to know what you think. You can do that personally (twiain@twiain.com, or add a comment to this post), or publicly, in the form of a review. I’ve finished my first editing pass through Dark Glass, and after a number of tweaks I’m really pleased with the structure. Of course, there’s still work to do. The writing’s clunky in places, and I’m sure there are repetitions and other issues to deal with. And then I need to go granular, examining the actual words I’ve used. But I also need to ensure I haven’t added anything to this version that contradicts following books, so I’ve started re-reading the rest of the series. I wrote the original three books a couple of years ago, and even though I can go back over my notes, there’s much I’ve forgotten. I have fond memories of the second book, Dead Flesh. It’s the darkest book so far, but it also has a very emotional arc for Rodin, as he develops (or maybe uncovers) a stronger conscience. So I was looking forward to re-reading this book. It starts well, throwing the reader straight into Rodin’s latest contract, and I’m pleased with how I balance the (pretty sickening) violence with Rodin’s growing unease at the acts he’s being called on to perform. But the book’s not perfect, and as I read on I came across passages that weren’t as good as my writing is now. As I approached the middle section of Dead Flesh, a nagging voice started asking if this book, like the first, needed a re-write. Now, that voice was nowhere near as forceful as it had been with Dark Glass (and that book definitely needed reworking), but it started a worrying train of thought‌—‌if the second book could be improved, then so could the third, and so on. I’m improving as a writer all the time (partly because I’m paying more attention to the way I use words and structure stories, partly through actively learning through craft books and podcasts, and partly because I try to write every day), and so everything I’ve already written has the potential to be improved. I always aim for my next book to be my best yet. But if I constantly returned to older books, pulling them up to my current writing standard, I wouldn’t be producing any new books. This clearly isn’t sensible‌—‌I enjoy creating new stories, and readers who have already started on my books deserve to have those series completed at some point. Just think of the way readers have moaned about the long wait for George RR Martin’s next book. Also, if I want to improve as a writer, that means working on all stages of producing a finished story‌—‌planning, writing and editing. I won’t get that all-round constant learning if I’m only editing. Besides, it’s not as if Dead Flesh is a bad book. As I read on, I became increasingly immersed in the story (one advantage of reading books that have faded in memory). When I reached the climax, I was pleased with how this part of the series reads. I still love how the final scene plays out after all the action and violence, and it sets Rodin up for what he faces in Dominions III (and beyond). Yes, there are things that could be improved in this book, but I’m fine with how it stands. So I’m not going to re-write Dead Flesh (and, when I get on to reading Deep Water, I doubt I’ll feel the need to re-write that either). Instead, I’m going to continue working on Dark Glass, and then I’ll concentrate on new books With everything I’m learning through this re-working process, I’m sure that new book (Dominions V) will be my best yet‌—‌until the one after that. I’ve reached my first milestone. About a week ago, I finished the new first draft of Dark Glass (a combination of writing new scenes and editing old ones). After completing a first draft, I put it aside for at least a few days, just so I can get some distance from it. Then, I pull up the Scrivener file (that’s the software I use for writing), and compile a mobi file, which I then transfer to my Kindle. I want to know if this draft works as a story, so I need to approach it as a reader. Creating an e-book of this first draft means I can read it just as I read any other book‌—‌on my Kindle, relaxing on the sofa or in bed, coffee at hand. As I read, I try to ignore grammar and spelling, and instead focus on the story itself. Does it flow well, with changes of pace that don’t jar? Does the plot make sense? Do the characters act and react in believable ways? Whenever I start a read-through like this, I’m both excited and nervous‌—‌excited because I can still remember the good things from writing it, and nervous because I’m never sure how much will work, and how much will need major changes. With Dark Glass I have more pressure, because I need this to be better than the original version. And this new version’s not perfect. There are many things that need altering. Of course there are‌—‌this is a new first draft. But, overall, I’m very pleased with what I have now. I’ve added more scenes than I’ve taken out, but I’ve tightened those old scenes, and this new version is about 10% shorter than the original. This means that it moves faster, addressing the complaint that the original was slow (it was). I’m pleased, also, with how Rodin (the main character) is more proactive the whole way through. Rather than waiting for an opportunity to kill Leopold, he’s working toward that goal from the moment he steps into the Dome. But something else has grown in this version‌—‌Rodin’s inner change. Now, he’s more aware of how the Dome is altering his perception, and how he’s side-tracking himself from his job. It’s also opening up more possible questions about his past. There’s more to be done, of course. I have a list of things to address now, notes on individual chapters and thoughts on the book overall. But I’m excited. I can’t wait to pull up the Scrivener file and dive back into Dark Glass. It’s an interesting process, reworking a novel that already exists. Some parts of the original need to go, and new sections need adding. But there are many scenes where the story works, but the writing doesn’t, or where they feel okay but could be better. For a while, I saw two ways of dealing with these sections, each with their own pros and cons. First, I could edit what I already had. This made a lot of sense‌—‌why re-invent the wheel, right? If the story was okay, I’d only be changing language. But there was an awful lot I wanted to change. In many scenes, I doubted there would be many sentences left untouched. With that much work, maybe my second choice would be better. Second, I could start from scratch and totally re-write the scene. I wouldn’t be hampered by what I already had. I wouldn’t have to wade through sentences and paragraphs that I didn’t think much of. But in the long term I knew this process would take longer. Yes, I’d have a tighter first draft of each scene, but I’d still need to edit. But then I came up with a third way. Not a compromise, but a way of combining the best bits of the other two methods. I’d start from fresh, but reuse wherever I could. I write in a piece of software called Scrivener. In some ways it’s like a normal word processor (like Word), but uses multiple files stored all in one place. I use a separate file for each scene, and then store these scenes in chapters. I also have pages for notes of all kinds‌—‌story arcs, characters, settings, general notes, and so on. It’s easy to have more than one file open on the screen at any one time. When I’m normally writing, I’ll often have the scene I’m working on in the largest window, and notes to one side. But for this re-working of Dark Glass, I’ve changed things a little. For each scene, I’ll start a new file‌—‌a blank page‌—‌but I’ll have the old scene up too. I’ll first-draft my new version while keeping an eye on the original. There are some good passages in this, and when I reach a point where I can use one of these sections I simply copy and paste it across. Of course, I still need to do some editing on it, but changing a paragraph or two is far easier than changing a whole section. So far, this way of working seems to be going well. I’m feeling pretty good about the whole re-write at the moment‌—‌I’m reducing the word count while also adding more to the story, which should mean it reads faster. If nothing else, this addresses the comments on the slow pace of the novel. And I can see myself using this process when I’m editing other stories‌—‌I’m not only improving Dark Glass, but I’m refining the way I work. Win-win! I’ve started writing some of the new scenes for Dark Glass now. The first of these I did was Rodin’s first attempt to assassinate Leopold. I was excited to write this. I had it all planned out, knew what was going to happen. And it ties in with certain themes that return in later books, too. We get a chance to see Rodin working without his usual weapons. We see him planning and executing a removal‌—‌even if (spoiler alert) it goes wrong. But as I wrote this scene, something felt off. I’d write a sentence, then wonder if it was good enough. I pushed through, onto the next sentence, the next paragraph‌—‌but I had the nagging doubt that this writing wasn’t as good as I expected. Worse, the writing itself didn’t feel like an improvement on the original Dark Glass. And then I remembered something‌—‌because this was a new scene, this was a new first draft. And first drafts are always messy. The first draft, even of a single scene, exists to get the words down, one after the other. It exists to tell the story. A first draft shouldn’t be about clean writing, and it’s allowed to have errors‌—‌spelling mistakes, poorly formed sentences, unrealistic dialogue, weak descriptions. If a scene (or a book) is a sculpture, the first draft is the point when the big chunks of rock have been hacked away. There’s a basic shape, but the edges are rough. There’s no detail‌—‌the head is a round blob, the hand has no fingers. But this doesn’t matter, because the next round of work (the edits) will add details and smooth edges. Slowly, those harsh edges will become smooth contours, and ugly sentences will become flowing prose. This is the process I went through with the original Dark Glass‌—‌first draft, then rounds of edits to refine both story and writing. So there’s no way I should be directly comparing that finished product with these messy first drafts. It’s like comparing a plain sponge to a decorated cake, or a single-track home recording of guitar and voice to a professionally recorded full-band version of the same song. It’s like comparing a first screenplay to a completed movie. So yes, these new scenes are messy. But that doesn’t matter, because at this stage they are improving the story. And the writing? A few rounds of edits, and I’m confident I can pull that past the standard of the original novel. It’s good to know I’m on the right track. Warning: There will potentially be spoilers in this post, both for the original version of Dark Glass and the new version I am currently working on. So, first things first. If I’m going to rework Dark Glass, I need to figure out what the major problems are in the current version. A couple of reviews have said it’s slow, and on re-reading I can see what they mean. There’s a lot of superfluous language, especially when things move into the Dome. I think I did some of this on purpose, trying to show how those in the Dome were more verbose, but it comes across as poor writing. I can tidy this up. When characters in the Dome talk, I should add in the odd long word, and the occasional flourish to their language, but not so much that it detracts. It’s like dealing with accents‌—‌use the occasional dialect word, but don’t overdo it. But poor writing’s not the only thing contributing to the slowness. There’s also pacing issues. I intended this book to be a thriller, so it needs to move faster. I need to increase the tension and the action (external and/or internal). Connected to this, I also need to deal with broken (or unfulfilled) promises. These are things I wrote, or hinted at, in the first few chapters didn’t bear fruit later. I set up expectations in the reader, but failed to deliver on them. The big one is Rodin. I set him up as a cold, calculating mercenary He’s paid to kill people, and he’s good at his job. We see this, when he escapes his booby-trapped room and then kills the assassin sent after him. But we don’t see anything else like this (apart from a few flash-back scenes) until the very end. For most of the book, Rodin does pretty much nothing. He bumbles along in the Dome, he talks to Leopold, he misses opportunities to kill the man‌—‌but he’s not proactive until the end. So I need to change this. From the moment Rodin enters the Dome, he needs to be working toward assassinating his target‌—‌this is what he has been hired to do, and he’s a professional. Obviously he has to suffer set-backs, but he needs to be trying. And those who are protecting Leopold need to be more active too. I can’t use the excuse that ‘things move slower in the Dome’, because both sides in this struggle are ruthless. If those wanting Leopold removed are willing to hire help from outside the Dome, then surely those protecting him would also seek help wherever they could? Rodin needs to be targeted. It might not be the kind of fight situation he’s used to (in fact, it would be better if it wasn’t, because then he is more out of his depth, and has to work harder to succeed), but the story needs some kind of villain, even if that is a faceless group of people bent on stopping Rodin assassinating Leopold. The whole book needs a major re-write in the middle. But there are other promises I need to address. I state that Rodin’s weapon of choice is a lance (a toughened syringe that can inject a choice of drugs into a victim)‌—‌but he never uses his own lance. This I can easily rectify‌—‌when he returns to the Dome at the end, and finally has Leopold where he wants him, Rodin can subdue the man with his lance. Another broken promise is the glass blade. In the original, Rodin manages to sneak this blade into his meeting with Genna and Cat, and uses it to threaten Cat. But it isn’t used again. I don’t like Rodin’s actions here anyway. He’s not one for rash behaviour, and so it’s out of character for him to pull a blade in a meeting like that unless he seriously intends to kill someone. So I can remove this part of the scene, and in doing so remove that promise. So I’ve been restructuring the whole story, taking some parts out and adding a lot more. Rodin tries to complete his job sooner, and the inevitable failure of that first attempt causes more difficulties for him to overcome. And the roof garden mentioned in the scene when Rodin first meets Daventree‌—‌that now plays a bigger part. I’ve cut back on a lot of the background/history/explanation of the Dome‌—‌it’s still there, but in small doses, hopefully as part of the story rather than as info-dumps (and there were an awful lot of them in the original). I know I’m going to find more story issues as I work through Dark Glass, but I’m pleased with the changes I’ve made so far. Already, the book feels more solid. Still a long way to go, though. To read Reworking a novel part 1, click here.